I had never used puff pastry before, so I thought I would try something new. The instructions on the box seemed fairly easy. Just unfold the dough, thaw it for 40 minutes at room temperature, then bake and decorate. I sprinkled some cinnamon sugar on the dough before baking. I always keep a jar on hand. It's great to sprinkle on french toast, crepes, waffles, cupcakes, etc. The dough only takes 15 minutes to bake. You can whip up your cream for the filling while the dough cools. Then comes the best part, the filling. I used my homemade dulce de leche (but you can use store bought) and made some whipped cinnamon mascarpone frosting that I also used for my Churro Cupcakes, Cinnamon Chocolate Cake, and my Pumpkin Spice Crepes. It's great as a frosting or filling. I love it! The pastry dough it so light and flaky. The mix of the dulce the leche with the cinnamon mascarpone frosting tones down the sweetness of the dulce de leche. Overall, it's like eating a cloud. A soft, fluffy, sweet cloud. You don't feel heavy or guilty after eating this. But it tastes superb. I am going to have to make some more desserts with puff pastry now. Remove 1 sheet of puff pastry and place on a plate. Thaw at room temperature for about 30-40 minutes, or until it is pliable. Unfold pastry sheet on a lightly floured surface and cut into 3 strips at the folds. Sprinkle the strips evenly with 1 teaspoon cinnamon sugar. Place the strips on a greased baking sheet. Bake for 15 minutes, or until the tops are golden brown. Carefully remove the puff pastry from the baking sheet and place on a cooling rack and prepare cream filling. With an electric mixer or stand mixer on medium speed, whisk heavy cream until stiff peaks form (be careful not to overbeat, or cream will be grainy). In another bowl, whisk together mascarpone, cinnamon and confectioners' sugar until smooth. Gently fold whipped cream into mascarpone mixture until completely incorporated. 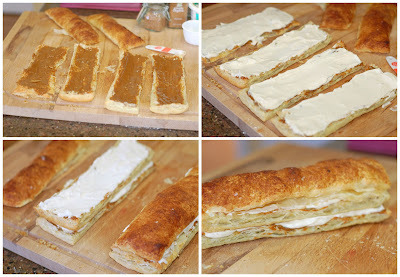 Now that the puff pastry has cooled, cut each into 2 layers lengthwise, for a total of 6 layers. Sprinkle the remaining 1/2 teaspoon cinnamon sugar onto the three bottom layers. Then spread 2 tablespoons of dulce de leche on four of the layers (keep 2 nice looking pieces for the tops). And spread the mascarpone filling evenly over the dulce de leche. Next begin layering. You are making two "sandwiches", so each "sandwich" should have a bottom puff pastry and a middle one with filling, and the top one which is bare. Place the two desserts in the fridge for a 1/2 hour to an hour to set before cutting. Once set, cut each dessert into three squares with a wet serrated knife, for easier slicing. Top with strawberries or fresh whipped cream. Enjoy! Mix together the sugar and cinnamon until well blended. Keep remaining mixture in an airtight container and use to sprinkle on french toast, oatmeal, yogurt, waffles, crepes, etc. These sound absolutely amazing! 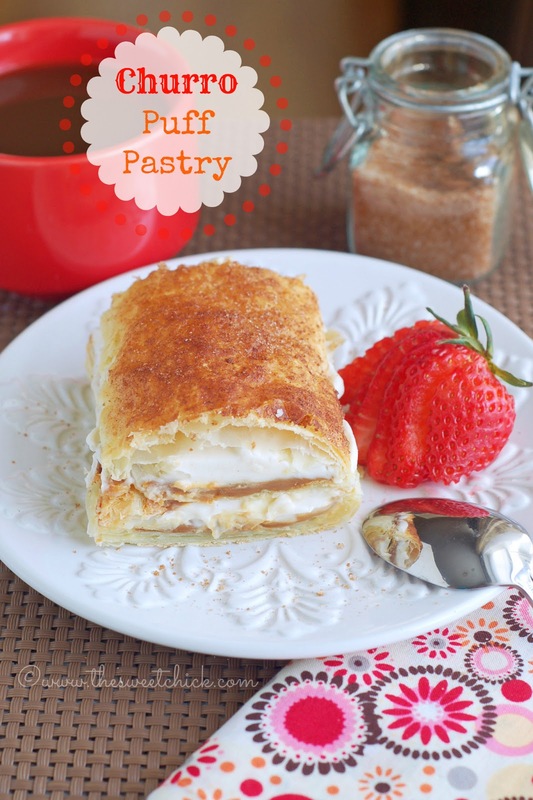 I love puff pastry and how it melts in your mouth! Pinning and trying for sure! 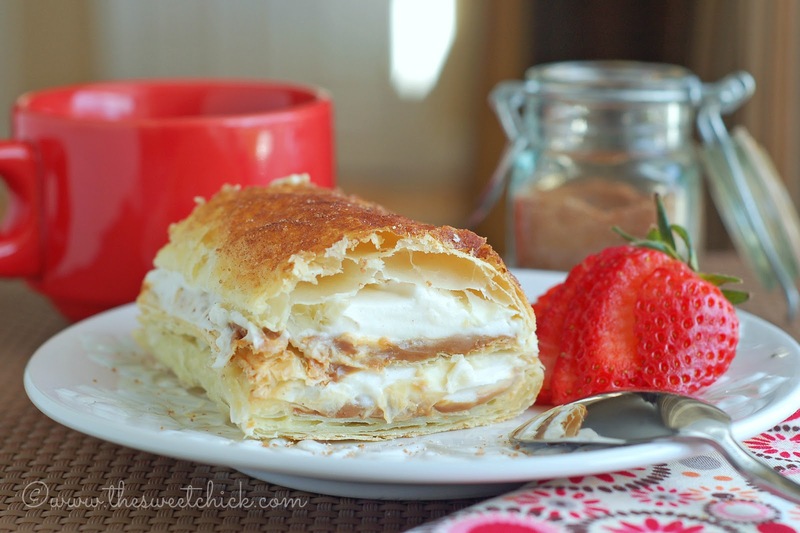 There is nothing that I don't love about this dessert...it's perfect! oh lward! I need this in my life! Thanks for linking up at Pint Sized Baker's Two Cup Tuesday Party! I've pinned this! I hope to see you again on Monday Night! Glad you like. See ya soon! Please tell me why the mascarpone curds? Two boxes I tried and every time it separates.... I'm so upset! I've never had mascarpone curd. I use the Bel Gioioso brand and never had any problems. You can find it at the grocery store or even at Walmart. Wow, these look incredible! What a great combination of ingredients....you had me at dulce de leche, but you added so many other yummy things, too! And as always, your photography is lovely. I am SO glad you shared these with us at Treasure Box Tuesday- pinned! Congratulations on your feature at Treasure Box Tuesday! This recipe looks yummy! 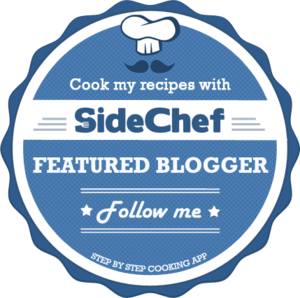 This is my favorite recipe of the day!